On a recent Thursday night I made my way to Montana Ale Works at 611 East Main Street in Bozeman for an early evening meal. Ale Works, as it’s locally known, has resided since 2000 in a renovated railroad freight house, and makes the most of it. A full—service rectangular bar and partitioned-off dining area running along the entire south wall are highlights. Five pool tables are in use by folks of all ages and abilities. As we wended the narrow way to our table, we could see the rail car annexed to the main street side of the building being set with linens for a private gathering. This space is used as regular seating near the bar, as well as for private gatherings. The Grillroom is another more private space available for dinner reservations and special functions and gatherings found in the back of the restaurant. Hoping to find some Ale Works factoids, I perused the back of the menu. I found that they offer locally raised meats, sustainably farmed produce and fine artisan cheeses. Ale Works also donates their used vegetable oil to “local biodiesel pioneers.” On their website, www.montanaaleworks.com, Ale Works states “Our artfully-crafted upscale comfort food ranges from hand-cut, grassfed steaks to fresh seafood, local beef and bison burgers, entrée salads, grilled fish tacos and locally-sourced organic dishes. We offer the most extensive draft selection of regionally-brewed craft beers on tap in the Northern Rockies, plus a full bar, creative cocktails, house infusions and a diverse wine list.” Remember too that Ale Works has gluten-free alternatives for dinner and beer; please tell your server your preferences. Ale Works boasts nightly food and drink specials referred to as “Works of the Night,” which can also be found on their website. From 4-6pm you can get “happy hour small plates” ($5-7) and dinner specials ($12-29) and it’s the perfect place to start. We chose the Thai Ginger Beef skewers for our small plate. The tender sweet-salty-smoky beef skewers were dressed with lashings of Sriracha hot sauce and accompanied by wasabi-laced coleslaw; the skewers were awesome but the wasabi a bit too much considering the heat of the dish, although pleasingly cool and crunchy. Our Thai coconut curry soup was fantastic: a light and velvety combination of slightly spicy chicken broth and coconut milk with carrot, noodles and chicken chunks, garnished with green onion. As we ate, the place began to fill up. One thing I love about Ale Works is the eclectic mix of patrons, from college-age people to buddies of both genders to families with babies and grandparent-aged folks, all rub elbows cheerfully in the decidedly neighborhood pub atmosphere. The downside is that the ambient volume increased, echoing off the high ceiling. Increasing the volume of the music over the sound system did nothing but add to the general din; on the other hand, neither we nor our neighbors could overhear each other’s conversations. The husband’s eight ounce NY strip came with Texas toast, Ale Works magnificent pepper parmesan fries and coleslaw (sans wasabi) for $14.50. The hand-cut beef was easily the most flavorful and tender NY strip we’d ever had. The fries: hot and delectable, the coleslaw cool and refreshing. I went for the ”Works of the Night” halibut on roma tomato risotto with cab corn salsa and avocado butter ($29.00). The 2” thick halibut was cooked perfectly through, moist, and minimally seasoned with the large pat of avocado butter melting into it. It sat on a bed of broccoli rabe/carrot halves which in turn topped the risotto. The risotto was utterly smooth with delightful bursts of tomato chunks and the vegetables, although rather too buttery, made for a terrific texture contrast. The crab corn chutney didn’t quite keep up, although its visual appeal and texture were delightful. For dessert we enjoyed the tenderest of crepes wrapped around a rich light chocolate crÃ¨me topped with house whipped cream and blackberries, all nestled in a pool of fresh raspberry puree. It was simply heavenly accompanied by a cup of coffee in the thickest of off-white diner mugs. Wonderful. 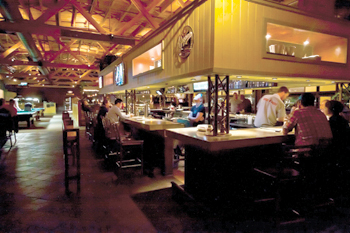 Montana Ale Works’ extensive menu boasts starters, salads, “the works” (house signature dishes and pub fare), half-pound burgers, sandwiches, pasta, steaks and ribs. Desserts are a change nightly. For a neighborhood type place the food supersedes the setting with a sophisticated combination of presentation, flavor balance, local and fresh ingredients creatively and thoughtfully prepared with a quality to be enjoyed, all in a relaxed atmosphere with fabulous service. Be sure to check out their website montanaaleworks.com to read more about Ale Works’ community involvement, farm to fork philosophy with an extensive list of local purveyors and the “Ale Workers” to learn more about the diverse and talented team that puts it all together. 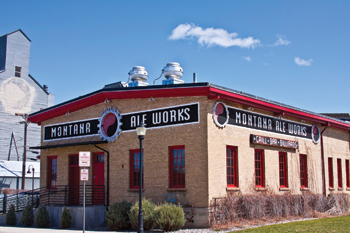 Montana Ale Works is located at 611 East Main Street Bozeman MT, 59715 (406) 587-7700. A. Washko moved to Bozeman in 1991 and enjoys cooking at home and dining out.